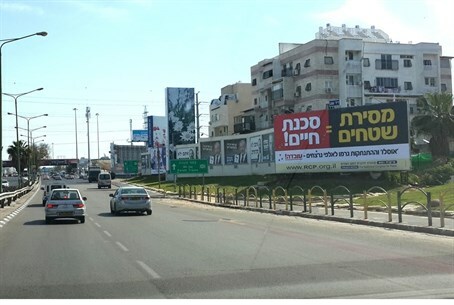 Rabbinical Congress for Peace erects hundreds of billboards noting that voting for withdrawals from Judea-Samaria will likely cost lives. A series of posters from a rabbinic organization have attempted to encourage voters to think of the consequences of a leftist government Thursday, via new poster campaign throughout Israel. The Rabbinical Congress for Peace (RCP) erected hundreds of posters which read “Ceding territory is a danger to life” and “Thousands were murdered as a result of Oslo and the Disengagement (from Gaza). That’s a fact!” on billboards at all major thoroughfares nationwide, it stated. The RCP which is comprised of over 350 prominent rabbinical and religious figures who have ruled that it is forbidden to negotiate agreements that include withdrawing from territory currently under Israeli control, based on the Shulhan Arukh (Code of Jewish Law), Orach Chaim 329, which states that giving up even an inch of the Land of Israel could lead to bloodshed. The rabbis claim that the message conveyed by this campaign is that the sanctity of life is above all. “The halakha (Jewish law - ed.) obligates every rabbi to bring the Laws of Pikuah Nefesh (matters of life or death) to the forefront, to explain it to every member of their community emphatically and in no uncertain terms," the RCP said in a statement. "In the midst of all the confusion of the election campaigns it is very easy to forget what is the most important issue – the security of the citizens of Israel." “These days we are witnessing how various groups and campaigns that are being funded with huge sums by the European Union are trying to blur the reality, to confuse the public and make it forget what has happened here in the last 23 years,” said Rabbi Avrohm Shmuel Lewin, Director of the RCP. “Not only has no one been held accountable for the thousands of victims that were caused by withdrawals throughout the years from Oslo until after the Disengagement from Gaza, but there is an attempt to persuade the public to vote for those parties that will continue in this dangerous path." "Therefore the campaign slogans by the various parties are concealing the real issue which is at stake," he continued. "The rabbis are the only ones who are telling it plain and bluntly as it is." RCP representatives stressed that they are not affiliated with any specific political party, however - and that, in their view, the issue is religious, not political.